Newcastle magician and comic Chris Cross has raised over £1200 for Brain Tumour Research in honour of Paul Daniels. 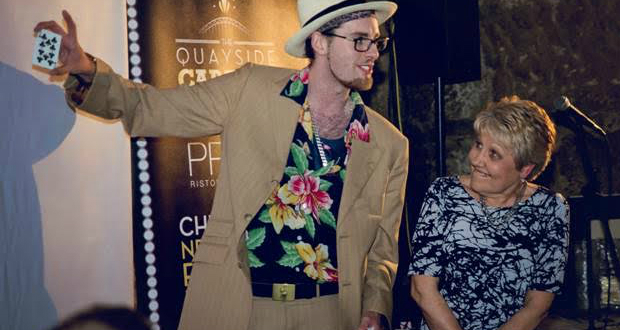 Cross held a sold-out charity gala on Newcastle’s Quayside on Thursday which raised £1,235 for the organisation. Daniels, from Middlesborough, passed away in March, having been diagnosed with a brain tumour only a month before. The gala, which took place at Cross’s Quayside Cabaret Club at PRIMA Pizza Pasta, raised the cash with a combination of a sit-down meal, live performances, raffles and a silent auction. Teeside’s John Archer, The Great Aziz and fire-eater Charlie Burns all made appearances, alongside video messages from Daniels’ wife Debbie McGee and their nephew. Cross said of the gala: “The North-East really prevailed and it’s great that this charity tribute was well attended, well received and it’s even better that we were able to raise £1,235.00 for such a worthy charity. “It was a classic example of us Geordies coming together and making the world a happier place!